A. Marusczyk, J. Albina, T. Hammerschmidt, R. Drautz, T. Eckl, G. Henkelman. Formation of peroxides in partially delithiated Li2MnO3 as obtained from DFT calculations. In the search for high energy density battery materials, over-lithiated transition metal oxides have attracted the attention of many researchers worldwide. There is, however, no consensus regarding the underlying mechanisms that give rise to the large capacities and also cause the electrochemical degradation upon cycling. As a key component and prototype phase, Li2MnO3 is investigated using density functional theory. Our calculations show that hole doping into the oxygen bands is the primary charge compensation mechanism in the first stage of delithiation. Upon further delithiation, there is an energetic driving force for peroxide formation with an optimal number of peroxide dimers that is predicted as a function of lithium concentration. 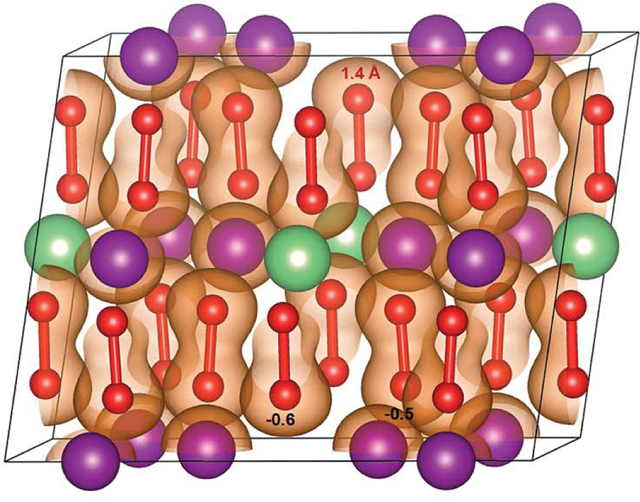 Unlike the defect-free phases, the peroxide structures are highly stable, which leads to two competing mechanisms for charge compensation: (i) oxygen loss and densification at the surface and (ii) peroxide formation in the bulk. Our results show that both have a detrimental effect on the electrochemical performance and therefore the stabilization of oxygen in the crystal lattice is vital for the development of high energy cathode materials. The insights into the origin and implications of peroxide formation open the door for a more profound understanding of the degradation mechanism and how to counteract it.